Over the last year breastfeeding twins as a fulltime working mom, I’ve had a lot of “air travel adventures”. There was the first time I pumped in my seat on a packed plane, and the glorious time an American Airlines stewardess curtained off her jumpseat area to give me a clean, private space. I’ll never forget bringing 25lbs of frozen milk back for the twins after a week in Costa Rica, and the kind United agent who waived the overweight bag fee since all the extra weight was breastmilk. 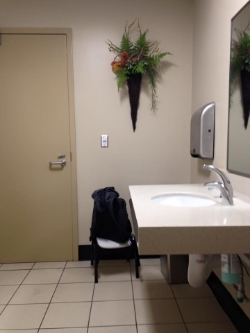 I’ll also never forget pumping tucked into a dirty corner of the Houston airport, just to have a tiny bit of privacy without pumping in an even dirtier bathroom. Through it all, I couldn’t stop thinking how uncomfortable and emotionally draining this all was. From being away from my small babies, the normal stresses of air travel, and dealing with pumping, to clogged ducts, maintaining supply, and the ever-looming threat of mastitis. If I hadn’t fought with everything I had to breastfeed my 35-weeker twins, I’d likely have thrown in the towel. If I hadn’t found a savvy working moms breastfeeding support group on Facebook, I doubt I would have had the confidence for those moments when I chose to throw on a cover and pump in front of hundreds of people in a crowded airport (choosing that over pumping in a foul-smelling bathroom). I found myself sad for other mamas who would have to endure this. I was disheartened thinking that if they didn’t have strong support or entrenched stubbornness, maybe they would stop breastfeeding because pumping during air travel can push you to your limits. I had seen other mamas posting pictures of beautiful lactation rooms or lactation pods in other airports, so I started to investigate a bit. I emailed some of the pod companies to ask about how they go about getting their pods installed in airports. I Facebook messaged Jenna Ikuta, the manager of the San Diego Nursing in Public Task Force, responding to a post of hers about breastfeeding advocacy, and asked if she knew anything about Terminal 1 in the San Diego International Airport, where pumping is particularly hard. From Jenna, I found out that as of January 2016 a new law in California would require a place for moms to pump that is not a bathroom in all airport terminals that had over 1 million flights per year, except terminal 1 in San Diego. I became a mom on a mission: even if it happened after I was done breastfeeding, something had to be done about Terminal 1 in San Diego. As it turns out, my “mission” had really already been completed – the lactation room in Terminal 1 opened earlier this fall. The San Diego Breastfeeding Coalition sent me an email to this regard, and I was shocked and excited. The following week I had a business trip and low and behold, after asking 5 employees someone finally knew what I was talking about and pointed me to the lactation room. It was beautiful. There’s still a bit of work to be done: educating employees about the lactation room, putting up a well-placed sign or two, and spreading the word among nursing mamas. I posted in a few of the local breastfeeding groups, and added the location to the great app “Moms Pump Here” that helps moms find pumping locations around the country. I’m ironically writing this on my first business trip in over a year without a pump – I’m just gone for the day and the twins are only nursing morning and night now. I hope that the next time you’re at the San Diego International Airport for a Southwest flight you enjoy the new facilities: just past security to your left, tucked under the escalators. After submitting Emily’s letter to the San Diego International Airport’s Customer Relations Coordinator (with the help of the UCSD’s Lactation Supportive Environments Department), we were thrilled to report back to Emily that there were, in fact, THREE Lactation Rooms at the San Diego airport. It appeared that the security and airport staff just had no idea that all three existed. Since this misinformation was brought to the airport’s attention, they have gone above and beyond to make these Lactation Rooms available and accessible to breastfeeding and pumping moms. First, they have placed the breastfeeding symbol on their interactive map, showing where all of the lactation rooms are located. Secondly, they have sent out a press release so that all of their staff members will know about the Lactation Rooms and where they are located. Hopefully the last step will be to take Emily’s advice and affix well-placed signs throughout the airport so that moms can easily find these rooms when they need them. We would like to commend the San Diego International Airport for making breastfeeding and pumping moms a priority in their renovation plans and for creating a wonderful space where moms may have some well-deserved privacy. Thank you, Emily, for bringing this to our attention so that all breastfeeding and pumping moms traveling through our airport can benefit from these rooms! And, for moms who would like to breastfeed their children throughout the terminal, remember that California law protects your right to breastfeed in public! Safe travels during the busy holiday season, and beyond! Have you seen a Lactation Room or a Mamava Lactation Suite at one of the airports you have traveled through? Snap a photo and place it in the comments so that we can share this information with other traveling moms!